Brazilian international Fred, former Roma and Milan defender Cafu and Dutch football legend Clarence Seedorf will unveil the adidas brazuca: The official match ball of the 2014 FIFA World Cup™ in Brazil. 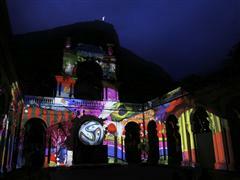 ‘brazuca’ will be launched with a spectacular 3D light projection onto the iconic Parque Lage building just below the famous statue of Christ the Redeemer. The much-awaited ‘brazuca’ ball carries a Brazilian-inspired design and new improved construction consisting of six identical panels. The bladder and carcass of the FIFA World Cup ™ ball is identical to the ever popular Tango 12 (UEFA Euro 2012), Cafusa (2013 FIFA Confederations Cup) and UEFA Champions League Official Match Balls. ‘brazuca’ went through a thorough testing process over a two and a half year period involving more than 600 of the world’s top players and 30 teams in 10 countries across three continents ensuring that it is suited to all conditions. Clubs involved in testing included AC Milan, Bayern Munich, Palmeiras & Fluminese. Players involved in the process included Leo Messi, Iker Casillas, Bastian Schweinsteiger & Zinedine Zidane, and the ball was used, with a different print design, at the FIFA U20 World Cup and a friendly match between Sweden and Argentina earlier this year in February. ‘brazuca’ meets and exceeds all FIFA metrics for an official match ball. The name ‘brazuca’ was selected back in September 2012 following a public vote in Brazil involving 1 million football fans ‘brazuca’ is an informal local Portuguese term that means “Brazilian.” A host of Brazilian celebrities, Olympic athletes, actors, musicians and artists attended the launch including identical twins Beatriz & Branca Feres the 25-year old synchronized swimming sisters.